Viral Story About Free Wi-Fi Spotlights Mostly Hidden Policy War : It's All Politics You've heard of the war on women, the war on religion, and more recently even the war on the Second Amendment. Washington is full of so-called wars. But a war on Wi-Fi? 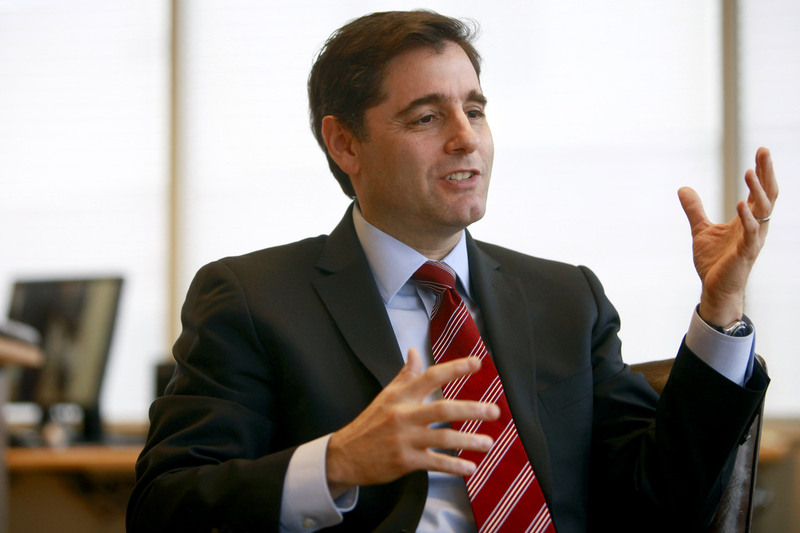 FCC Chairman Julius Genachowski last year warned of a "war on Wi-Fi." In Washington, there's always one kind of alleged war or another against some group or idea — the war on women, the war on religion and the war on the Second Amendment come quickly to mind. This week, many of us became aware of another supposed conflict we had never heard of: essentially, a war on Wi-Fi. Furthermore, the story pits one group of corporate giants and their lobbyists — a group including Google and Microsoft, who reportedly support the FCC proposal — against another group, the wireless phone industry, who reportedly oppose it as a competitive threat. That certainly sounds like a war on Wi-Fi, though in fairness to The Washington Post, they never used that lively phrase. Alas, people who closely follow developments in the digital world have been pouring cold water on the "free Wi-Fi for all" fire ever since the story went viral. Examples from some of the killjoys are here, here, here, here and here. Basically, there is no new FCC plan that will in the relatively near future lead to an explosion of free Wi-Fi. Rather, the story pulls together various pieces of FCC policy ideas that have been around in some cases for years. And their details are much more technical and less eye-popping than suggested. "The article gave one the impression you're going to have all these new wireless competitors popping up," said Gigi Sohn, a telecommunications policy expert. "A lot needs to happen before that takes place." Sohn is president of Public Knowledge, a nonprofit that advocates for consumers' digital rights. Sohn added in an interview: "It's a long way from where we are today or where we might even be if the FCC set aside a nice chunk of the spectrum for unlicensed use, to a full-blown, gigabit (per second), competitive service." Translation: We're not close to much faster and cheaper, if not free, broadband and Wi-Fi. As Sohn pointed out, it would be hugely counterproductive for the cellular phone service providers to make war on Wi-Fi, since they count on the technology to move the voice and data traffic that exceeds what phone-network technology alone can handle. "The Verizons and AT&Ts desperately need Wi-Fi because it allows them to offload traffic from their otherwise congested networks," said Sohn. "It makes me laugh to have this debate drawn as between the telcos and the tech companies, because the telcos need the Wi-Fi world as much as the tech companies do." The FCC announced last year that it plans a 2014 auction of spectrum that is to be voluntarily handed back to the government by TV broadcasters who no longer need it because of the transition to digital from analog broadcasting a few years back. It's thought that some of that spectrum regained by the government could be put to unlicensed purposes, including what the cognoscenti call super WiFi. "The FCC's incentive auction proposal, launched in September of last year, would unleash substantial spectrum for licensed uses like 4G LTE. It would also free up unlicensed spectrum for uses including, but not limited to, next generation Wi-Fi. As the demand for mobile broadband continues to grow rapidly, we need to free up significant amounts of spectrum for commercial use, and both licensed and unlicensed spectrum must be part of the solution." So, OK, does all of this mean that there's no war on Wi-Fi? Well, actually there apparently is something of a war because the FCC chairman said as much in a speech last October. At the University of Pennsylvania's Wharton School, Julius Genachowski, the FCC chair, spoke of a "nascent war on Wi-Fi." What he was talking about is a disagreement that is partly partisan and partly about companies trying to gain or keep their competitive advantage. Without getting too technical, Genachowski, an Obama appointee, and some congressional Democrats want to make more spectrum available on an unlicensed basis since that would allow innovators to experiment and invent new products and services. We got baby monitors and wireless mics after the FCC did something similar in 1985. In fact, we also got Wi-Fi from that spectrum emancipation. Some congressional Republicans have suggested that Genachowski wants to make too much spectrum available for unlicensed purposes. That would reduce the amount of spectrum that could be sold to licensed users like cellphone service providers, money that would go to the federal Treasury. "Let me make it clear. I support the use of unlicensed spectrum to foster innovation and to provide much-needed offload for congested mobile broadband networks. ... What I cannot support is the unnecessary expansion of unlicensed spectrum ... that are actually needed for licensed services, especially at the expense of public safety." Besides that partisan divide is the competitive divide between the phone sector and the high-tech sector. Innovations made possible by the availability of more unlicensed spectrum, the Skypes of the future, could threaten some of the phone company revenue streams. The phone companies don't make this argument, of course, which might seem a little too overtly self-serving. Instead, they couch many of their concerns about the creation of more unlicensed spectrum as technical or legal in nature. Meanwhile, high-tech companies like Google and Microsoft, with their disruptive technologies, see plenty of upside in making the Internet more ubiquitous. "Earlier this year, there was an effort in Congress to prohibit the FCC from designating any TV band spectrum repurposed through the incentive auction for unlicensed use. "Why oppose balanced spectrum policy ideas that include more spectrum for both licensed and unlicensed use? Why launch a war on Wi-Fi? "I see things differently. I believe clearing and auctioning spectrum for exclusive licensed use must remain a core component of spectrum policy, and that we should also pursue next-generation ideas like spectrum sharing and expanded unlicensed use. Let's not just talk about a forward-thinking FCC. ... Launching a war on the kinds of ideas that gave us Wi-Fi would be a self-inflicted wound to U.S. innovation and economic leadership." So while the FCC doesn't really have a plan that likely will lead to public and free Wi-Fi across the nation, the controversial story did at least give many people a chance to stumble into a national policy debate that, to most folks, had been as invisible as radio waves.